An additional, though less common, BTL-A4 variant known as the "LongProbe" was equipped with a nav computer, backup hyperdrive, advanced scanners, and an extended fuel supply in place of the weapons systems officer. The "LongProbe" was used primarily for long range scouting missions. On such missions longprobes operated in recon teams known as "Longprobe Y-wing Recon Teams". 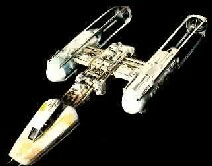 Y-Wing Longprobes were often used instead of ELINT platforms when exploring Outer Rim territories. The ever moving Rebel Headquarters was due to the diligence of the Longprobe teams.